Once upon a time, there was a great and powerful country called Freemerica. Its people were decent and hardworking and dreamed of one day owning their own home in this leader of all other nations. The people of Freemerica depended on its leaders, President Bungler and members of the House of Ineptitude to protect them from evil forces. Freemericans built roads and bridges, provided all the services, and worked hard every day to make sure their country remained great. After working strenuously hard for many years, most families looked to realizing their dream of owning their own homes. One such family was the Gullibles. They had heard that there was this nice man, Mr. Glutton, who could help them get the money for their dream house. When the Gullibles told Glutton that they didn’t have enough money for a downpayment or even to make their monthly payments, this nice gentleman told them not to worry because their house was going to be worth so much more they could always get more money to pay for it. The Gullibles were so happy. What a great guy that Mr. Glutton was. He even told them that they could pay a very small amount at the beginning until their home was worth a fortune next year. The Gullibles were more than happy to pay Glutton his commission for all his hard and thoughtful work. Many other families from the Gullible’s community, Suckerville, went to Mr. Glutton for their homes as well. Now, Glutton worked for the local Bank of Incompetence. This lending institution provided the money for the people of Suckerville and collected the monthly payments. One day the Bank President, Mr. Indulger, realized that there were too many homes and not enough people to fill them so the homes values went down. The Gullibles and the rest of the Suckers couldn’t pay the bills! What to do with all these bad loans? Indulger knew that there was a really rich group of people who worked on Small Street, the Greeds, who would take them off his hands. They were smart and really wanted to help others. The Greeds had some of the most beautiful offices in the world. They even had lavish fish tanks filled with mostly Cell Fishes (take a moment to digest….now proceed). Just like the fairytale where a woman spun straw into gold, so did the Greeds spin these bad loans into great investments for others to make a lot of money. In this way, they were so similiar to Mr. Glutton and the people from the Bank of Incompetence. They smushed all these loans into a nice package, put a bow on it, and it really looked just right to put under their Christmas trees. It was so great that Freemerica had such nice people to help the Suckers because President Bungler and all the members of the House of Ineptitude could play golf and go on vacations since they didn’t have to worry about Freemericans. The Greeds sold these golden packaged investments to Freemericans who had a lot of money; money they held for the hard-working people like the Gullibles. They sold them to banks from other smaller countries, to school boards, and others looking for safe investments. They even bought insurance to protect their investments. How lucky were the Suckers to have the Greeds! Rumor had it that they even did business in a far away country called the Cayman Islands…there, their money would be safe. All the people of Freemerica were more than happy to see the Greeds make so much money. After all, they were so nice and doing eveything for the hard working people of their country. They deserved every ten thousand dollar bill they earned. One day a strange plague came over Freemerica. The skies got very dark. There was thunder and lightening and the Greeds went into hiding. The Gullibles and the Suckers stopped getting their money from the Greeds for their safe investments and wanted to know why. It was hard to find out because all the Greeds were on a yacht in a faraway place. Who was to blame for this mess? Was it the hard-working Freemericans? They blamed Glutton. Glutton blamed Indulger. Indulger blamed the Greeds. The Greeds blamed Bungler and the House of Ineptitude. It was time to call upon President Bungler and the members of the House of Ineptitude. The phone kept ringing until finally the President woke up. He said that he had the proper “strategery” to fix the problem. Many of the Ineptitudes didn’t agree with him so Bungler promised those who disagreed a new set of golf clubs if they’d go along with his plan. They relented and immediately planned a big party. So the people of Freemerica were afraid that they would lose their dream homes. They worked so hard but couldn’t buy enough food for their children or send them to college. Some of them couldn’t even get a job or put gas in their cars. The only ones still smiling were the Greeds, President Bungler, and the memebrs of the House of Ineptitude. But two superheroes from another planet came down to tell the Freemericans that they can save the day. They claimed to know how to fix the problem. They were even hinting that some of the Greeds could be locked up in the Fortress of Voracians for a long, long time. One of these superheros would be the new President of Freemerica. But the Suckers were skeptical because one had a funny name and the other seemed angry. Most fairytales end with: And they lived happily ever after. Let’s hope one of the two superheroes can lead all Freemericans to that fitting conclusion. So that ends this ridiculous fairytale that could never possibly happen (to be continued!!!!!). The company is doing well overseas too, and there’s plenty of room still left for growth. About eight years ago (GIS) received only 5% of its sales from outside the United States, now it’s 25%. E/R due 12/17 (not conf). The short term ema is still above the long term ema but I would wait for the other technicals to recover before taking a position on this great equity. Buy 100 shares of GIS at $58.11 and sell the Dec.55; GIS KK (ITM) call for 5.70 and get a safe 5-week return of4.7%. This annulaizes to a 47% return. In addition, we have a downside protection of 5.6% (311/5500). Once again, selling cc options in an environment when the market is not behaving in an orderly manner is inherently more risky than usual. Unlike many of the companies in danger of going under these days, General Mills balance sheet is “very solid”. The company held three debt offerings in the past year and all three were subscribed. (GIS) has outperformed the market indices for 10, 30 50 years… “any period you want to choose, the CEO said. In an emergency action in conjunction with the central banks in Canada and Europe, the Federal Reserve’s Open Market Committee (FOMC) cut its target Federal Funds rate by half a percent to 1.5%. Wall Street did not receive this news favorably! This was obviously an attempt to infuse liquidity through the world’s banking system and to bring confidence to the global financial system. A sharp drop in consumer debt was mainly attributed to falling demand for autos thereby resulting in fewer new car loans.Also the trade deficit declined by 2%, a reflection of a worldwide economic slowdown (sorry folks, just reporting the news, not creating it). The S&P 500 was down 18.2% for the week for a year-to-date loss of 38%. When this market starts to turn around, we could be in for the ride of our lives! Only a few seats remain for this month’s webinar. Great story. Very funny. However not so funny for many Americans. Keep up the good work. Wow. Very interesting “fairy tale”. I particularly enjoyed the “cell fish” (it took me a little while to understand it too, but I’m slow). I too can’t wait for one of the “Super” heros to fix the problem. Thanks so much to all of you who wrote to me about my latest article. I enjoyed writing it and was hoping you would appreciate reading it. For those of us who have been through dramatic downturns in the economy and the stock market, recent events have not been as traumatic than it has been to newer investors. It would be wrong to give up on investing in the stock market or the real estate market for that matter. If we had an initial investment of $100,000 and lost 50% in a severe market downturn, we would now have $50,000. In order to restore our investment back to it’s original amount, that $50,000 would have to increase by 100%. What chance do we have of accomplishing that with a 3% CD or treasury note? Take a look at the big dip that occured on the chart in 1987. Had an investor thrown in the towel after the “crash” he would have missed out on a 5-fold increase in his portfolio as of today even after the recent decline. History tells us that the market will increase in value 11% per year in the long run. Our economy is resilient and seems to recover even when the picture appears to be hopeless. We, as investors, have to make a decision. Are we able and willing to withstand the risk of the short term volatility of the market? If the answer is yes, then decades of the stock market performance bodes well for the long term success of our portfolios. The decision is a personal one. If you are losing sleep and have developed a personality disorder from the current crisis, money markets and treasuries are probably best for you. Otherwise, stay the course because history is telling us not to worry. For those of us capable of staying sane through an insane market, corrections like today justify our positions. Imagine those who ran for the hills last Friday. Now there is no guarantee that the market won’t fall dramatically tomorrow. Remember, the bond market was closed today and the trading was on light volume. But common sense tells me that factored into a 40% drop in market capitalization in such a short period of time is a ton of market psycholgy and better days are ahead. Once again, as I stated in a previous post, I am still invested in stocks but stopped selling options temporarily so that a market rally (like todays) is not capped by the option obligation. Once things normalize, I’ll be back to garnering my 2-4% per month. 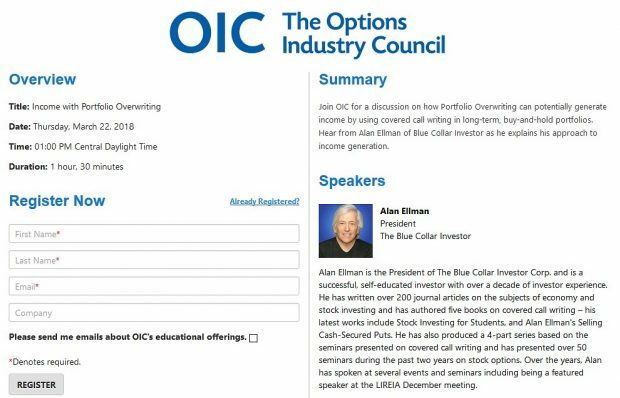 Thank you for all of your work, service, and support of the “Blue Collar Investor” community. Based on what I’ve learned from you, I have stayed alive in this market. However, I own a number of stocks that are WAY down (some over 50+%) based on methodologies that I learned prior to becoming one of your disciples. So…my question is what to do with these stocks. Do I sell and redeploy the capital…do I try to work OTM calls until I can get close to even…or some other approach? Do you have any suggestions? I’m sure that this question is is on many , if not all, of your students. I’m looking forward the the webinar…after reading the book twice…watching all of the DVDs…and listening to the CDs when I’m driving and flying. Thanks so much for the kind words. I, too, am looking forward to the upcoming webinar series. For the past several weeks I have been checking the screens on all my equities. Those that have turned negative fundamentally I’ve sold. The resulting cash is used to purchase stocks with the best fundamental ratings (the technicals with most are poor to worse!). The healthiest companies fundamentally are the ones most likely to be bought up by the institutional investors when confidence is restored. The reason I remain in the market is not to miss days like today. Over the years I’ve developed a strong stomach for market downturns. I have stopped selling options temporarily so as not to limit what I hope is a dramatic market correction. We’ll see.